This blog post was originally published on the Discover Society – Policy and Politics blog on 2 January 2019. I have watched an enthusiastic, well-intentioned lobby for evidence-based policy on my campus for several years. However, I frequently reflect that if I were to opine publicly on evolutionary biology, or astrophysics, with as little knowledge of the subject as various scientifically trained persons hold forth on public policy, I would soon be read out of the intellectually reputable part of the university community – and rightly so. In celebration of this year’s APPAM theme of improving policy-making by developing and engaging with evidence, we bring you the latest and best of our research on this topic. From our prize-winning article on Evidence translation: an exploration of policy makers’ use of evidence by Jo Ingold and Mark Monaghan, which defines a new conceptual model of evidence translation highlighting the crucial role evidence plays in the policy process, to Richard French’s exploration of answers to the question whether it is time to give up on evidence based policy. The ‘multiple streams approach’ (MSA) is one of policy scholarship’s biggest successes. 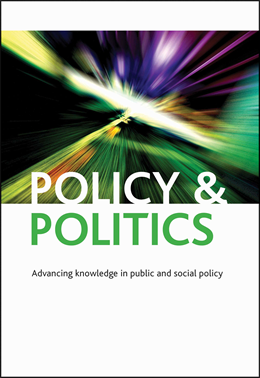 Kingdon’s original is one the highest cited books in policy studies, and there is a thriving programme of empirical application and theoretical refinement. Yet, I argue that its success is built on shaky foundations because its alleged strength – its flexible metaphor of streams and windows of opportunity – is actually its weakness. Most scholars describe MSA superficially, fail to articulate the meaning of its metaphor, do not engage with state of the art developments, and struggle to apply its concepts systematically to empirical research. These limitations create an acute scientific problem: most scholars apply MSA without connecting it to a coherent research agenda. An extended version of this blog post was originally published on Discover Society. From the number of drug overdoses to annual average temperatures, public transportation ridership rates to Gross Domestic Product (GDP), government is inundated with data documenting social problems. In theory, these statistics should lead to more informed decision making. In practice, they are heavily politicized. Organized interests compete to ensure that their preferred statistic is adopted as the preferred measure of a given policy problem, a testament to these so-called “problem indicators” are important determinants of policy maker attention. From a prevailing, long-standing debate in the journal on the welfare state, we bring you a collection of our best and most recent articles. To highlight just a couple: Anthony McCashin’s How much change? Pierson and the welfare state revisited provides a structural overview of the impact of globalisation on analyses of the welfare state. Meanwhile Sharon Wright, through forensic scrutiny, exposes the gulf between the discursive constitution of the welfare subject by policy makers, and the lived experiences of those subjects in her article Conceptualising the active welfare subject: welfare reform in discourse, policy and lived experience. In this new virtual issue, we bring you our most impactful and recent research from diverse perspectives with a coherence of focus on increasing our understanding of public services and reform. To introduce two highlights from the issue, opening the collection is one of our most innovative articles on how health discourses are linked to population health outcomes, hence the title: Working-class discourses of politics, policy and health: ‘I don’t smoke; I don’t drink. The only thing wrong with me is my health’. Moving from health to employment, Rebecca Taylor analyses the changing dynamics that come into play as the provision of employment services increasingly moves to public, private and third-sector organisations in her article entitled UK employment services: understanding provider strategies in a dynamic strategic action field. Covering a diverse range of public industries, other articles in the collection offer insightful studies across education, social care, disability, counter-terrorism, local government and state regulation.